LOCATION.--Lat 39°20'15", long 74°30'47" referenced to North American Datum of 1983, Margate City, Atlantic County, NJ, Hydrologic Unit 02040302, on pier near southeast end of toll bridge on Margate-Northfield Road (County Route 563) at western edge of Margate City, 500 ft east of Pork Island, and 3.2 mi northeast of Great Egg Harbor Inlet. PERIOD OF RECORD.--Unpublished fragmentary gage-height record, June 1997 to March 2000. Continuous-record tide gage, April 2000 to May 2012, June 2013 to current year. 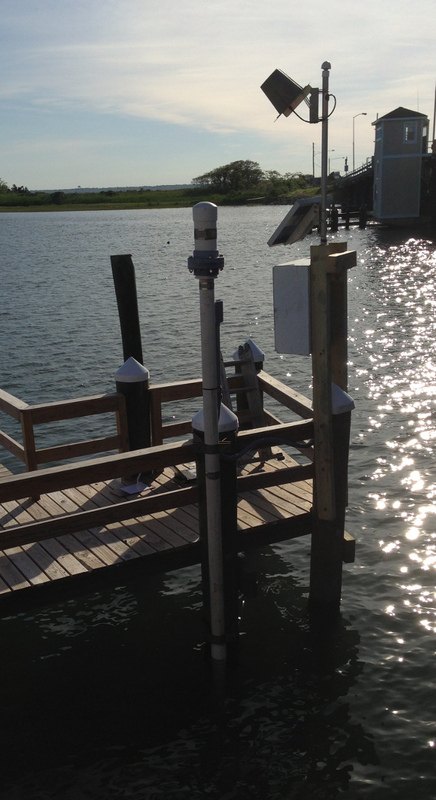 GAGE.--Tide elevation and water temperature recorder with telemetry and tidal crest-stage gage. Datum of gage is at 0.00 ft NAVD of 1988. To determine approximate elevations to NGVD of 1929, add 1.30 ft. REMARKS.--The gage was temporarily removed on May 3, 2012 due to pier construction and was reinstalled on June 4, 2013. Periods of missing data are noted by dashed (---) lines. EXTREMES FOR PERIOD OF RECORD.--Maximum elevation, 8.1 ft, Oct 29, 2012, from high-water mark; minimum elevation, -5.24 ft, Mar 9, 2005, although a lower tide may have occurred during period of partially missing record on Feb 17, 2007. EXTREMES OUTSIDE PERIOD OF RECORD.--Maximum elevation known, 9.8 ft, adjusted to present datum, Mar 6 or 7, 1962, from high-water mark near the intersection of Washington and Atlantic Avenues in Margate City.